If you have been following my blog for a while, then you might know how much I love Vedantika Herbals' Ubton and Facial Scrub. My mum loves it as well. So, when I received this package from them, I was delighted. This face wash contains Neem, Tulsi, Aloe, Soapberry, and Rose in it, which are all holy grails for skincare. Want to know how it fares on my skin? whether all claims were true or not? then keep on reading till the end to know more. 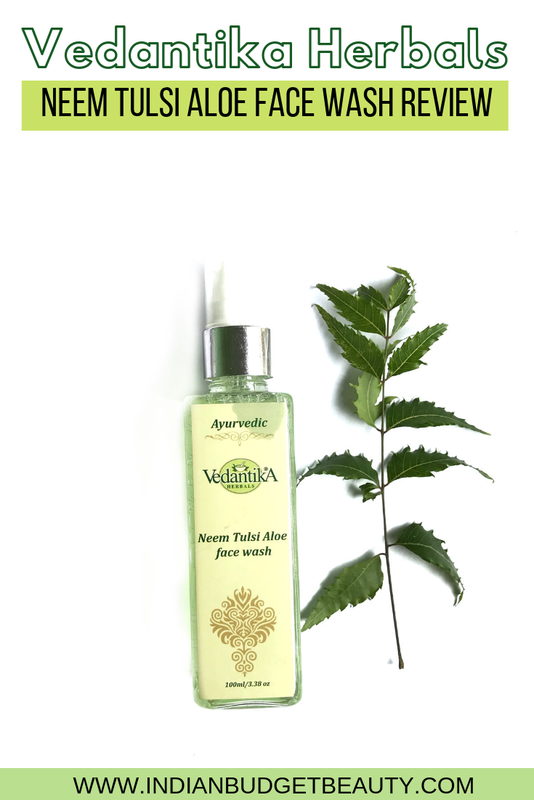 Vedantika Herbals Neem Tulsi Face Wash cleans and soothes the skin. The face wash with the extracts of Neem, Tulsi, and Aloe Vera is perfect for all skin disorders. It replenishes nutrients and hydrates the skin. This face wash is rich in antioxidant which heals and repairs damaged cell. Regular use of the face wash visibly reduces blemishes, pimple scars and pigmentation marks leaving a clear and an even tone complexion. This face wash comes in a clear plastic bottle with a white pump and cap. The packaging is very basic and sturdy. All the ingredients and the details are being mentioned on the bottle itself. The pump is of good quality, you can dispense the amount of product you want easily. Though the packaging is very sturdy, it will be hard to travel with. The face was has a runny gel-like consistency. It has a slight green tint to it as well. Texture wise, it is very smooth. Vedantika Herbals Neem Tulse Aloe Face Was has a pleasant smell to it which is very soothing. It contains ingredients like Neem, Aloe Vera, Tulsi, which have many antibacterial, anti-inflammatory properties. It even contains Rose which helps to clean the skin, reduce redness and Soapberry which maintains the pH of the skin. The first thing I've noticed after I've used this product is that this face wash does not dry out my skin. This is a hydrating face wash that makes your skin soft to touch. So, if you have sensitive and dry skin, you can definitely invest in this product. It has a soothing fragrance which is very pleasant. Your face definitely feels very clean after you wash with this product and it does soothe redness on the face if there's any. All you need is about 3-4 pumps of the product and you are good to go. It does foam up a bit. But, if you have super oily skin then this is not the product for you as it won't remove the oiliness from your face. I've been using this product regularly for a while now, but I haven't seen any reduction of blemishes, pimple scars and pigmentation marks so that claim does not hold true in my opinion. I really wished that the packaging would have been a little better. Other than that, you can definitely try this product out. The pump is quite good. Some claims do not hold true.